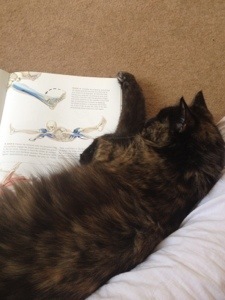 I'm a writer and editor, specialising in education and health. I'm a hypnotherapist and yoga teacher, helping people let go of what's holding them back from being their true selves. 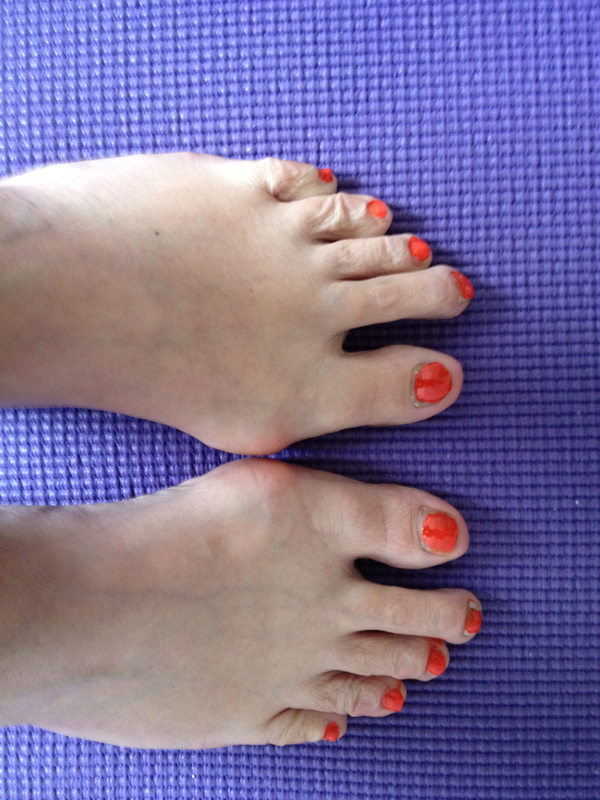 I specialise in yoga for releasing stress, in whatever way that presents itself, currently working with clients one-to-one and in small groups. Certified Hypnotherapist, Advanced RTT Practitioner and 400 hours BWY-trained yoga teacher. Living in Eastbourne, UK. Thanks to the wonders of Zoom, working with people everywhere. Well that was a shocking gap in proceedings. Many thanks and best wishes to all who dropped by during the interval. 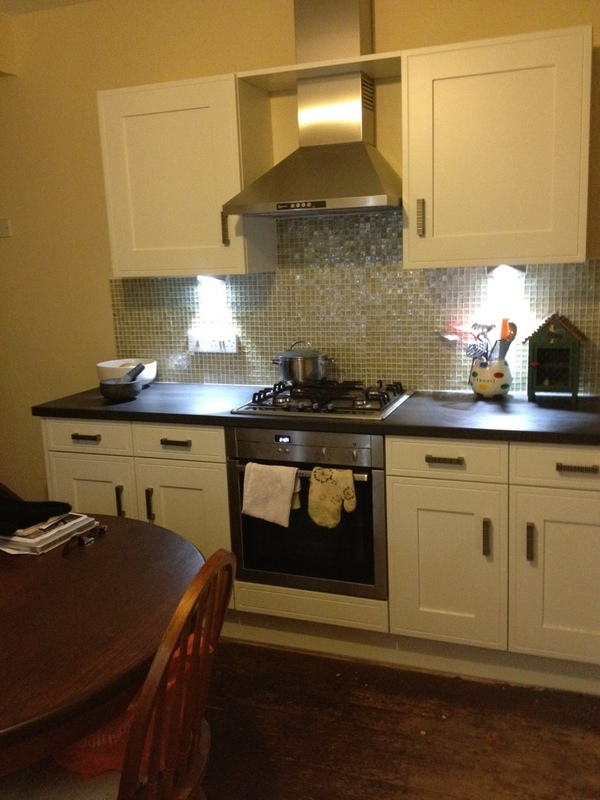 So, this is end of the day and as you can see, kitchen-wise I have a fitted kitchen. What I don’t have is a gas supply because British Gas has now confirmed my whole gas supply is incorrectly fitted and has to be redone. And that can’t be done until next week. So, no hot water or central heating. Still. And a hefty bill I hadn’t allowed for. It could be worse. It could be snowing. Thank heavens for fan heaters and kettles. 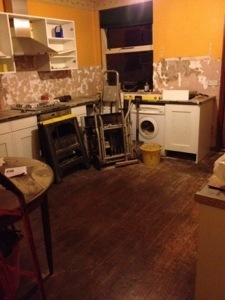 Home from work after day 4 and we have.. Appliances and a sink. Nothing works except the fridge so at least the milk will stay fresh. Yesterday we had the drama of discovering my kitchen gas supply had been put together by a cowboy who hadn’t welded joints but had used water pipe joins. Not ideal. Or indeed very safe. So the gas peeps are coming tomorrow to check out what’s what and hopefully all is ok *makes a wish*. I’m getting used to living in a bedsit and a diet of cold meat slices and salad. So far today I’ve invested time in clearing out clutter. Clutter to eBay, clutter to give away. I’ve planned, schemed and watched a lot of Tim Ferriss on YouTube. That man knows how to tell his story and his use of metaphor – really smart. And Steve the fitter has finished for the day so I’m treating you to a shot of day 2. Can you tell what it is yet? 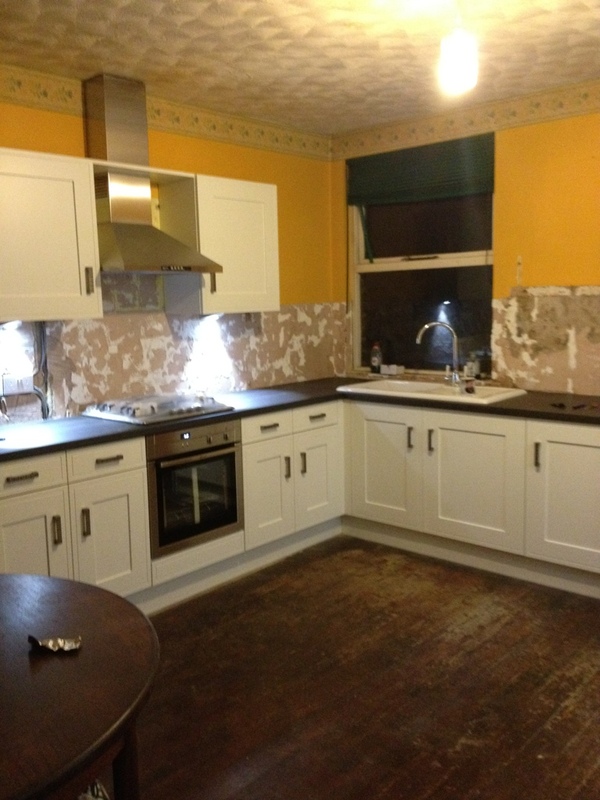 So… See the blog below… That is my kitchen after day 1. You think that’s a lot of boxes, you should see my sitting room. I say ‘see’… It’s boxes mostly, you can’t see anything. Fifi the cat is confined to the back bedroom/yoga room/laundry room. She is not happy about her daytime confinement but it’s better then getting in the way while the fitter, Steve, drills and fits. I wasn’t happy about doing my morning yoga with the smell of cat biscuits wafting about either but we all have to make sacrifices here. The house resembles Steptoe and Son’s yard. But it’s only for a week. They promised. Who’s that laughing?! It’s been a while. What can I say?! 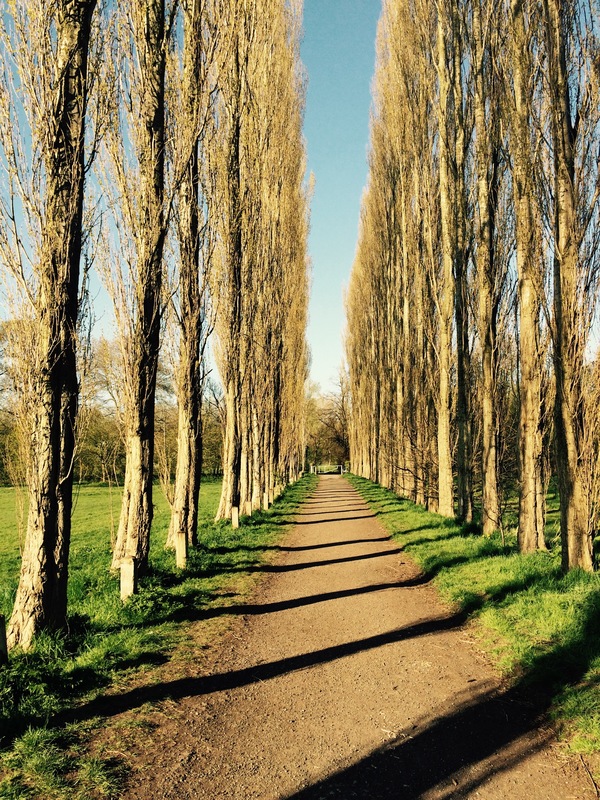 Here we are in Autumn and I’m still a mile away from running but yogaing on. I’m thinking I should start a new blog as I haven’t run for over a year now and while injury is injury, my chances of getting back to running look increasingly slim. While you think I should tell you what I’ve been doing. Working mostly. 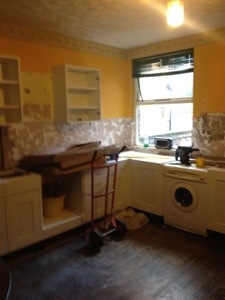 As I type a man called Steve is fitting my new kitchen downstairs for which I have been saving. For-ever. The tendons in my left leg are slowly but surely stretching, the muscles are getting stronger and that’s in no small part thanks to yoga. When I think how tight my tendons and muscles were around my arthritic hip and down my leg last Autumn, when early onset osteoarthritis was diagnosed… I was in pain most of the time, I couldn’t sit cross-legged without my left knee being up in the air – and I immediately tipped over to the right. Bit of a mess really. Nine months of physio, strengthening exercises and yoga and I’m almost balanced. I’m now on to a course of core strengthening, squats and lunges. I go to classes weekly and practice daily but in the Autumn I started taking yoga more seriously and i wanted to study it in more depth so I began a monthly, all-day Saturday yoga course which ended last week. It was a sad-happy day full of laughter and tears as the group talked about what they’d gained from the course. It’s powerful stuff, yoga. It can change much more than your body. It can open your heart and help you mould the way you view life. Sad though it was to say our ‘good-byes’ at 5 o’clock, it’s not a complete goodbye as we’re all getting together in December for a full day of yoga with our beloved teacher. And some of us will see each other before then, because a number of us – including me – are going on to yoga teacher training. Believe it or not, even in the north, the sun is shining. This is Bolton. Yes, that’s right – not Bath, Bolton. 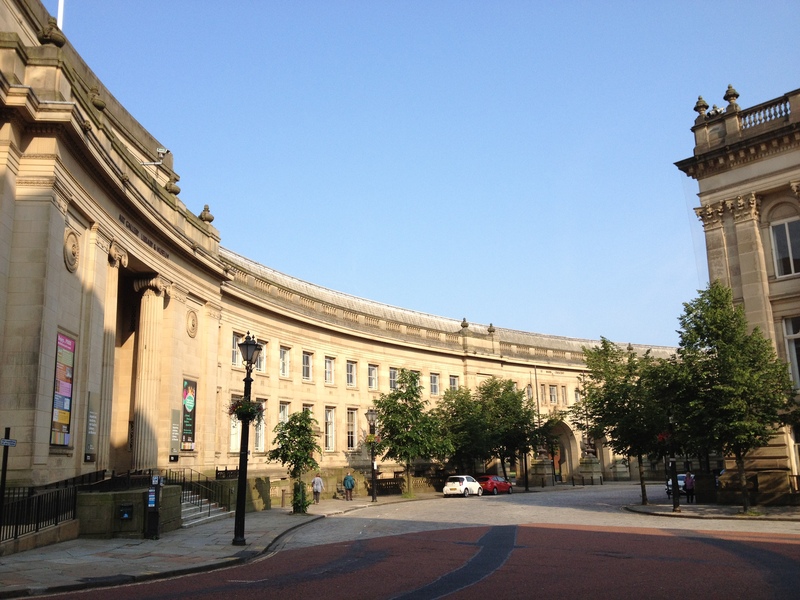 We have a beautiful cobbled crescent and as I trotted off to work on Friday I snapped some views for the University facebook page. 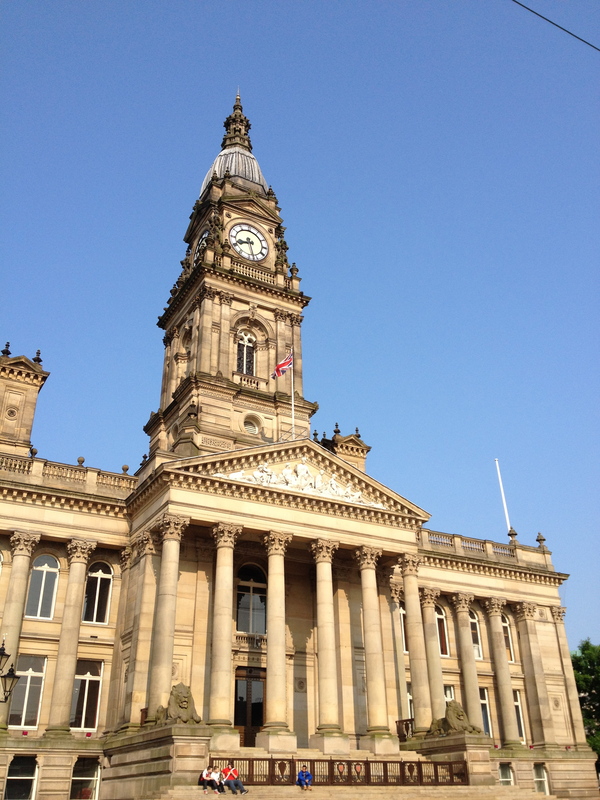 The town hall was looking pretty gorgeous too. 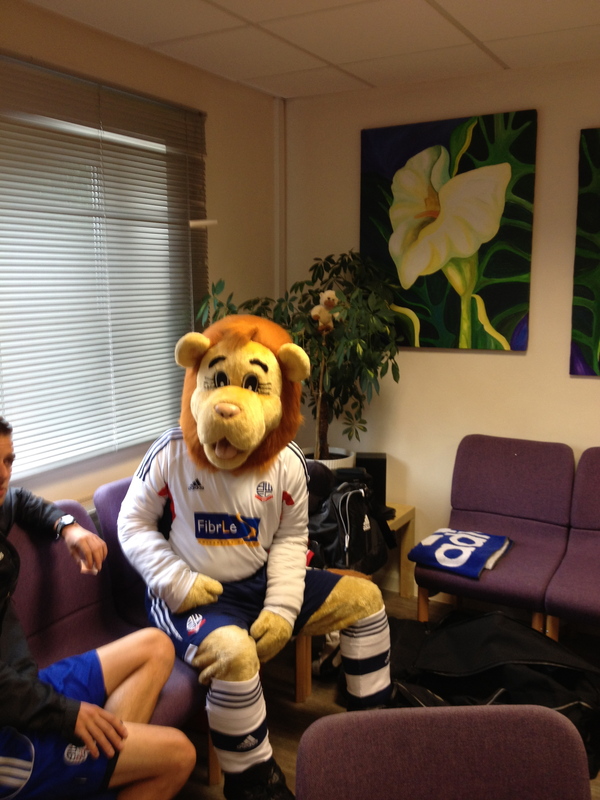 And on Tuesday I made a new friend in Bolton, Lofty the Lion. Lofty was at a local primary school, helping one of our graduates tell children about their new green energy business as the mascot of the town’s football team where their company, FibrLec, is principal sponsor. The children loved Lofty and, of course, it’s difficult to resist a big cuddly lion. As you can see! You can’t resist hugging Lofty. One of the privileges of my job is meeting inspiring people. 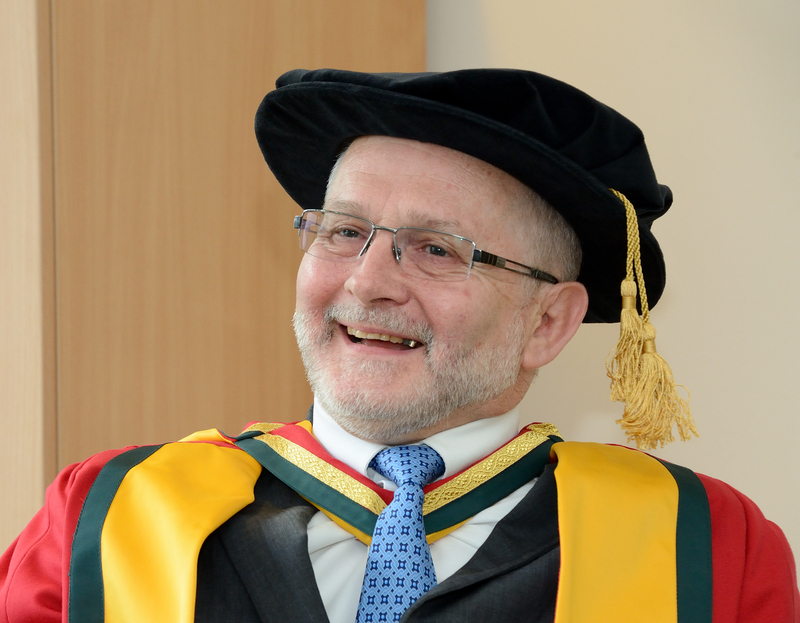 Sir Philip Craven MBE, who is President of the International Paralympics Committee, falls into this category and I got to meet him last Friday when my university awarded him an Honorary Doctorate for his work. Sir Philip received a Doctorate of Science in recognition of his outstanding contribution to sport and in particular to the London Paralympics 2012. He’s a very clever man with a northern sensibility and humour that’s infectious. He’s won many medals himself as a wheelchair basketball player, but as the man at the helm of the Paralympics movement he’s been instrumental in driving forward an amazing sea-change in public perceptions. Because the Paralympics had a significant impact on our country. Research carried out before the Games finished discovered one in three UK adults changed their attitude towards people with an impairment and eight out of ten adults thought the Paralympics had a positive impact on the way people with an impairment were viewed by the public. The Paralympics in London created so much excitement here last year. If any one event could underscore how Paralympians are as great as Olympians, how we may all be different but fundamentally we are all the same – we are all one – then the London Games gave us that. I run the press office at my university so I am there on these big days, to look after media wanting interviews. We had a one-off event for Sir Philip because he couldn’t make the summer degree congregation ceremonies next month. But I will be meeting the Olympic cyclist Jason Kenny then – no runners but plenty of athletes about just at the moment. 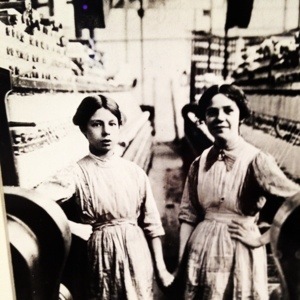 These two fine young ladies were mill workers in Bolton, Lancashire in 1915. Due to the climate here in the North West of England – basically dank – the cotton industry thrived. Last night I went to the opening of Textile Treasures at Bolton Museum where our University contributed to the future of textiles. These young ladies are just part of the show. For while the cotton mills may have had their day, technical textiles are thriving. You’ll be familiar with the moisture-wicking fabrics that make running so much less of a chaffing, sweat-sodden experience. But smart materials crop up everywhere from wound dressings that deliver drugs in just the right measure to improving green energy generation. It’s been a busy week of shows and exhibitions and some pretty poor eating. I’ve eaten a lot of sandwiches and nil salads. But is my final yoga school on this course tomorrow so long week behind me and on to the big chill.